From: Absinta et al. J Clin Invest. 2016;126(7):2597-2609. doi:10.1172/JCI86198. Sethi V, Nair G, Absinta M, Sati P, Venkataraman A, Ohayon J, Wu T, Yang K, Shea C, Dewey BE, Cortese IC, Reich DS. SLOWLY ERODING LESIONS IN MULTIPLE SCLEROSIS. MULT SCLER. 2016. PII: 1352458516655403. BACKGROUND: At autopsy, 20%-40% of chronic multiple sclerosis (MS) lesions are labeled “slowly expanding” and feature myelin phagocytosis at the lesion edge. As pathological lesion classification relies on a single, terminal time point, the rate of lesion expansion cannot be directly measured. OBJECTIVE: To study long-term volume changes in individual MS lesions. METHODS: Volumes of individual lesions on proton density magnetic resonance imaging (MRI) acquired between 1992 and 2015 were measured in 22 individuals (one lesion per person). After correction for acquisition protocol, a mixed model evaluated lesion volume changes. RESULTS: The mean (standard deviation) lesion volume at baseline was 142 (82) mL, falling to 74 (51) mL after 16 (3) years. All lesions shrank over time. Change in lesion volume did not correlate with change in supratentorial brain volume (p = 0.33). In simulations, the results could be explained by a process of slow radial expansion superimposed on substantially more rapid resorption of damaged tissue. CONCLUSION: We noted sustained radiological contraction of MS lesions, a surprising result given that fresh myelin breakdown products within chronic active lesions are observed relatively frequently at autopsy. Therefore, the primary pathological process in chronic lesions, even those described as “slowly expanding,” is likely to be tissue loss. Absinta et al. Persistent 7-tesla phase rim predicts poor outcome in new multiple sclerosis patient lesions. J Clin Invest. 2016 Jul 1;126(7):2597-609. BACKGROUND: In some active multiple sclerosis (MS) lesions, a strong immune reaction at the lesion edge may contain growth and thereby isolate the lesion from the surrounding parenchyma. Our previous studies suggest that this process involves opening of the blood-brain barrier in capillaries at the lesion edge, seen on MRI as centripetal contrast enhancement and a colocalized phase rim. 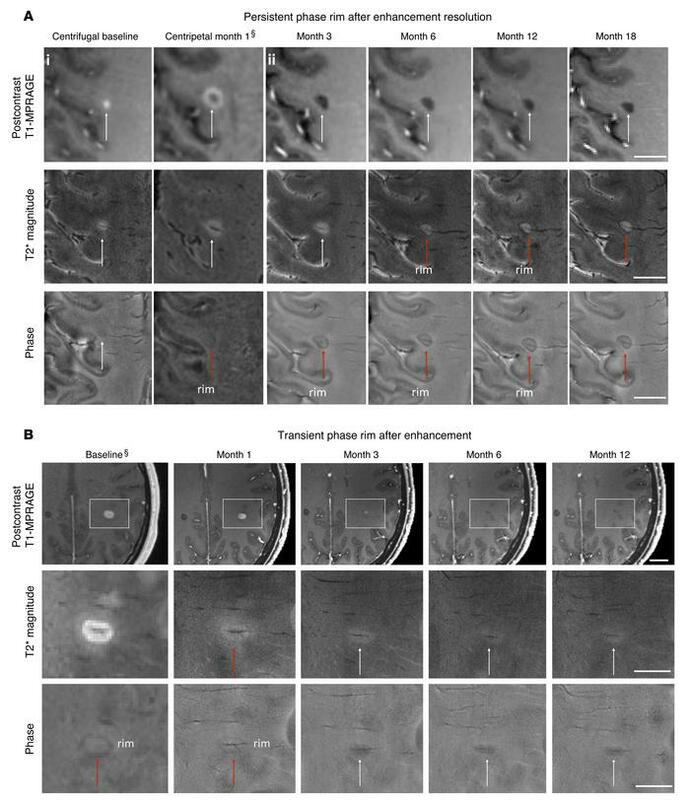 We hypothesized that using these features to characterize early lesion evolution will allow in vivo tracking of tissue degeneration and/or repair, thus improving the evaluation of potential therapies for chronic active lesions. METHODS: Centripetally and centrifugally enhancing lesions were studied in 17 patients with MS using 7-tesla MRI. High-resolution, susceptibility-weighted, T1-weighted (before/after gadolinium), and dynamic contrast-enhanced scans were acquired at baseline and months 1, 3, 6, and 12. For each lesion, time evolution of the phase rim, lesion volume, and T1 hypointensity were assessed. In autopsies of 3 progressive MS cases, the histopathology of the phase rim was determined. RESULTS: In centripetal lesions, a phase rim colocalized with initial contrast enhancement. In 12 of 22, this phase rim persisted after enhancement resolved. Compared with centripetal lesions with transient rim, those with persistent rim had less volume shrinkage and became more T1 hypointense between months 3 and 12. No centrifugal lesions developed phase rims at any time point. Pathologically, persistent rims corresponded to an iron-laden inflammatory myeloid cell population at the edge of chronic demyelinated lesions. CONCLUSION: In early lesion evolution, a persistent phase rim in lesions that shrink least and become more T1 hypointense over time suggests that the rim might mark failure of early lesion repair and/or irreversible tissue damage. In later stages of MS, phase rim lesions continue to smolder, exerting detrimental effects on affected brain tissue. "It is easy to understand why these lesions won't respond to conventional DMTs, which typically target the adaptive (memory) and not innate immunity (hard-wired)." So does this mean HSCT won't affect these lesions? do all SPMS patients have these expanding lesions ? There is no reason why HSCT should affect activated microglia, though as with any effective DMT, completely stopping further inflammation in the CNS might see them return to a quiescent state over time. As Cinara says, it could be possible to potentially downregulate microglial activity with compounds such as aspirin but at the moment it's just a hypothesis (one I've been thinking about a lot) and needs to be tested. Once again however, there's no money to be made from drugs like aspirin so it's difficult to see how a trial could be funded other than via charities etc. Does aspirin / ibuprofen penetrate into the CNS? Do over-the-counter forms have any potential to affect activated microglia? The MS charities, no one, is interested in funding research into NSAIDs in progressive MS? Sometimes I really wonder… And maybe I should be very thankful to the first GP I saw about my first MS symptoms – that she prescribed high dose ibuprofen for the cramps. Shame that ongoing high dose increases risk of cardovascular problems. It is an area that in my opinion really could do with investigating properly. This NSAID stuff you mention is the most exciting area of potential research I've read in a long time. Gives me hope. How do I campaign for it to be funded?! I'm no chemist, and most of the document below may as well be written in Sanskrit and Ancient Greek as far as I'm concerned, but I thought this part interesting..? "The discovery of a second gene (COX-2) coding for cyclooxygenase and the demonstration that its protein product is distributed differently from the originally discovered enzyme (COX-1) raised the possibility that some of the beneficial effects of NSAIDs may be separable from their side effects by development of isoform-selective inhibitors. This hypothesis has been dramatically validated by the demonstration that selective COX-2 inhibitors are anti-inflammatory and analgesic but lack the gastric toxicity associated with all currently available NSAIDs." We shall see if simvastatin in MS Smart has a positive effect on progressive disease. This class of drugs attenuates activated microglia but as an add on with IFN beta it had no effect on brain atrophy as reported earlier. Is there still hope that statins can limit black holes and tissue loss? There's always hope. SMART looks at Riluzole, Amiloride and Fluoxetine. There's a separate submission under way for simvastatin phase III. Great post! Could Dr. Reich post on MS progression more frequently? Is there a research group attempting to dampen or inhibit "hot microglia" instead of the same old recycled T and B-cell therapies? Current therapies have inevitably failed thus far in treatment of progressive MS, other than the underwhelming 23% reduction by ocrezulimab in PPMS patients? Are we only treating a "downstream" response of MS (ie. T- and B-cells) and not the cause (activated microglia)? Is it possible that all MS forms are led by "hot" microglia and after the initial microglial attacks that RRMS is just a secondary or downstream autoimmune reaction of T and B-cells in the majority of MS patients responding to microglia as the antigen presenting cell? Progression just being the continued insult by activated microglia? Is this why most of the DMDs, esp. the CRAB drugs, thus far have not been shown to stop transition of RRMS into SPMS, as they only treat downstream of the cause of MS? Finding the trigger or antigen that incites the "hot" microglia or inhibiting the microglia will likely be the cure to all forms of MS if this is the case. Re: "…23% reduction by ocrezulimab in PPMS patients?" You need to read my post on therapeutic lag; 23% over 2-3 years may be 60% over 5-years. In progressive MS using walking and lower limb function it takes time to see a treatment effect. I say this as a general comment; in the ocrelizumab PPMS trial the survival curves went apart very early. Some people say too early! This is super interesting – perhaps I have read too much into this particular blog post, but to me this looks like it could be a very plausible explanation for the mechanism of progressive MS and why it has so far resisted existing DMTs. Would I be going too far if I said that this research, could potentially explain how progressive MS works? An explanation of what is increasing disability in PPMS and SPMS patients? Obviously more research is needed to investigate before we can make any firm conclusions, but how far could this line of enquiry take us? Similarly, could this potentially support your hypothesis about aggressive early treatment? Becuase if progressive MS ultimately is about lesions, then the stronger drugs will slow the accumulation of lesions and hence prevent progression. Whereas if this research is wrong, and progressive ms is nothing to do with lesion damage, then perhaps the jury is still out. I really hope I've understood this research correctly. This looks to me like the beginnings of an important breakthrough for progressive patients.